Collecting Antique Minton China and the history of the 200 year old Minton Company. Thomas Minton founded his factory in 1793 in Stoke-upon-Trent, England. He was famous for Minton ware, a cream-coloured and blue-printed earthenware as well as majolica, Minton bone china and Parian porcelain. Throughout its history Minton has often led the way in adapting fashions to the field of ceramics, resulting in a huge range of styles. Minton was just behind Spode with its production of Minton china around 1800, although none was produced between 1816 to 1824. Minton and Copeland share the claim to being the first to produce the fine, white porcelain known as parian in the 1840’s. A distinctive turquoise blue enamel (inspired by Sevres bleu celeste) is a special feature of Minton, seen at its most striking in the cloisonne range of wares imitating Chinese cloisonne enamelling on metal, much of which was designed by Christopher Dresser. The Minton factory continued to produce high-quality china and porcelain throughout the 20thC. Thomas Minton’s factory was outstanding in the Victorian period for its art porcelains. The first products of the Minton factory were blue transfer-printed wares and he also popularised the famous Willow pattern design. Superb quality Parian figures are another highly sought after Minton product. In the 1820’s Minton started bone china production and this early Minton China is regarded as comparable to French Sevres porcelain, which influenced it greatly. Minton’s was also the only English china factory of the 19th century to employ a Sevres process called pate-sur-pate. In 1836 Thomas Minton died and his son Herbert took over the business. At that time the Minton china factory production consisted of practical and unpretentious tablewares in painted or printed earthenware or bone china that followed the typical shapes and decorative patterns of the period. Minton figurines and ornamental porcelain production was increased from the 1820’s. Herbert Minton, succeeded his father as head of the firm, and it was due to him that the firm and gained it’s superb reputation. He enlisted the services of many skilled artists and was one of the 19th centuries most outstanding entrepreneurs, introducing new techniques and methods of production and establishing Mintons reputation for both industrial enterprise and artistic excellence. AWN Pugin, Sir Henry Cole, and Prince Albert were close associates whose designs were used by Minton. The painter and sculptor Alfred Stevens, the French sculptors Hugues Protat and Emile Jeannest, and the painter John Simpson were also employed there. In 1845, Herbert Minton took Michael Daintry Hollins into partnership and the tile-making side of the business became known as Minton Hollins & Co.
Herbert Minton’s successful experiments in making encaustic tiles during the 1840s put him at the forefront of a huge industry supplying the requirments of institutions, churches, and domestic interiors all over the world. Encaustic tiles are ceramic tiles with a decoration made of different colours of clay inlaid into the surface, a method originally produced in the middle ages. Later, Herbert lead the way in exploiting industrial techniques for producing printed and painted tiles, and for the rest of the century the firm produced tiles in a vast array of styles, many of them designed by leading artists such as Christopher Dresser, Walter Crane, John Moyr Smith, and William Wise. Relief-moulded tiles were introduced to the Minton range from the 1860s. 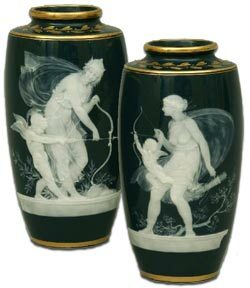 Parian Ware is a marble-like unglazed porcelain body developed during the 1840s and used most successfully for sculptural pieces. John Bell, the American Hiram Powers, and Albert Carrier de Belleuse were among the sculptors who produced statuary for Minton. Popular scaled-down models of larger pieces by contemporary and past sculptors were produced in Parian ware and the material was often used in combination with glazed and painted bone china for display pieces. Leon remained there until 1892 and among his achievements were the development of Renaissance inspired ceramics such as inlaid earthenwares, pieces painted in the style of Limoges porcelain and in 1850 Minton China introduced the richly coloured and heavily glazed majolica. Majolica was first shown at the Great Exhibition of 1851 and used for all kinds of objects from large garden ornaments and elaborate display pieces to dishes and jugs for the table. Arnoux attracted other French artists to Minton, notably the sculptor Carrier de Belleuse, the modeller and decorator Marc-Louis Solon and the painter Antoine Boullemier. Marc-Louis Solon introduced the pate-sur-pate technique to Minton, having developed it previously at Sevres. This beautiful but labourious process involves building up a design in relief with layers of liquid slip, each one having to dry before the next is applied. Using this technique, Solon and his apprentices modelled diaphanously clad maidens and tumbling cherubs on vases and plaques with a skill that was unmatched by any other factory. Herbert Minton died in 1858. After Herberts death the firm was run by his nephew Colin Minton Campbell and Colin was a visionary like his uncle. 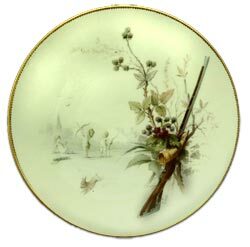 From the 1860’s Oriental decoration pre-occupied Minton. Highly original pieces, both in earthenware and bone china, evoked Chinese cloisonne enamels, Japanese lacquer ware and ivories, Islamic metalwork and Turkish pottery. The art studio was set up under the direction of the painter WS Coleman, in order to encourage both amateur and professional artists to decorate china and tiles for Minton. Although popular and influential, unfortunately the studio was burnt down in 1875 and was never rebuilt. Colin Minton Campbellwas indeed a visionary like his uncle, but after his death in 1887, his successors did not have the entrepreneurial skills. Even though excellent work continued to flow out of the factory, management languished among disinterested Minton family members and the company narrowly escaped bankruptcy. By the early 1900’s, most of Minton China’s great 19th-century designers and artists had died, retired, or left the company. 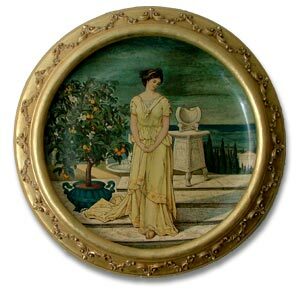 From 1902, a range of slip-trailed majolica wares became Minton’s contribution to Art Nouveau. Sadly, the 20th century brought progressively more difficult times, including disruption during two World Wars, until the company finally became part of the Royal Doulton group in the 1990’s. Minton China is today part of Royal Doulton Tableware Ltd but Minton still continues to implement special commissions while still producing the tablewares that the Minton company is best known for.